June 6, 2012 | Council members Barbara Halliday and Francisco Zermeno won re-election Tuesday night to the Hayward City Council. Former City Manager Greg Jones and planning commissioner Al Mendall also won seats on the council, while four-term incumbent Councilman Olden Henson’s 18 years on the council comes to an end. In a race that became a proxy battle for labor interests against the potential addition of Walmart and Hayward’s struggling business climate, each side registered somewhat mix results. Halliday and Zermeno’s somewhat risky votes last month welcoming Walmart appeared to have paid off Tuesday night. The business community’s familiarity with Jones also pushed him to victory. In fact, with Jones’s election, Hayward now possesses a rare sight in East Bay politics–an actual conservative on its city council. The city’s chamber of commerce struck out with Mendall’s election, however, despite a notably negative mailer sent by the group to Hayward seniors lambasting him for vote on the planning commission in April against Walmart’s proposed move to the former Circuit City building on Whipple Road. Henson, though, was not so lucky. Along with its downtrodden school district, Hayward’s city council has many continuing and quite vexing issues to tackle. Among them, attracting the types of businesses that campaign rhetoric prescribed for the city, along with development of the old Mervyn’s building on Foothill Boulevard and further work on the area around the South Hayward BART station. The council may also revisit its languishing gang injunction program this year. A discernible split had grown over the issue among the former council over its unwillingness to proceed with the controversy plan to curb gang activity, but potentially targeted the city’s youth and minorities. With Jones’s arrival–as city manager he procured federal funding to staff the program–the issue may give the first clues to the new council’s direction and its demeanor towards one another. Posted in Al Mendall, Barbara Halliday, Chamber of Commerce, Francisco Zermeno, Greg Jones, Hayward, Olden Henson, Walmart. Bookmark the permalink. The wrath of Walmart did Henson on. Too bad all the unions he helped by not approving Walmart did not do enough to re-elect him. I remember words of wisdom from Marharishi Mahesh Yoga: “People get the kind of government they deserve.” Think about it. Sorry for the anonymous label. I just don't get the options listed. On the other hand, those unions (mainly UFCW) did help get Mendall elected. 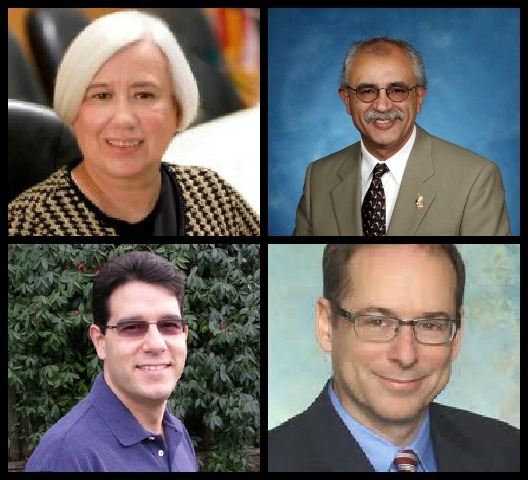 Life in Hayward is certainly going to become interesting for Hayward City Manger Fran David with two former City Managers, Greg Jones on the City Council and Jesus Armas on the Hayward School Board now taking high profile, active roles in city politics. Message to Councilman Mark Salinas: Thank you for not jumping into the Board of Supervisor's replacement fight. You have proven that the residents of the city of Hayward are your priority and I know you will continue to serve them right. Wow, I was hoping Farias would win just to see his short man syndrome antics.